I don't know for a fact that these two are in reality biologically related, but they look alike around the eyes, nose, mouth, forehead, hairline, jaw line, neck, and basic posture. Most likely at least a few genes are common to both. My best guess would be that they are sisters, though I could be wrong. Siblings have been a strong interest for those who study human development ever since that field of research began. The reason is the continuing question of how theory should treat factors of nature, like genetics, vs. factors of nurture, like nutrition or whether a father figure is present in the home. After many years of study, few would argue one or the other set of factors exclusively decides the eventual outcome. The interplay of both determines the course of development. It's also important to note that will or spirit plays a significant role. None of us is completely the victim of nature or nurture. We decide a great deal of what our lives will eventually look like, based upon both knowledge and ignorance, aspiration or lack of, imagination, tolerance for pain and disappointment, and willingness to buy into and play certain social games that distribute power, wealth, and prestige. It's an interesting exercise to try to imagine the mix of factors that have shaped both the apparent differences between these two ladies and the shape of the lives they will eventually lead. Neither looks debilitated by drugs. That's good. Also, at this point neither looks particularly well educated. That will probably limit both their choices going forward. The one in blue appears somewhat over weight and looks to have some sort of medical device strapped to her waist beneath her blouse. A diabetic? That will likely mean both a physical and financial burden for her to bear throughout succeeding years. Does she have the will to rise above that burden? Perhaps, but she also looks to be already somewhat weary. Not an encouraging sign. The one in plaid seems, by contrast, to be unaware of or at least unappreciative of her current advantage in health over her sister. Rather, she seems at present to be content to wait out whatever life holds in store for her, savoring both the current situation and her chaw of gum or candy. In other words, her exercise of will, aspiration, and imagination has been put on hold for the moment. That too isn't an especially encouraging sign. But, the setting is a carnival. 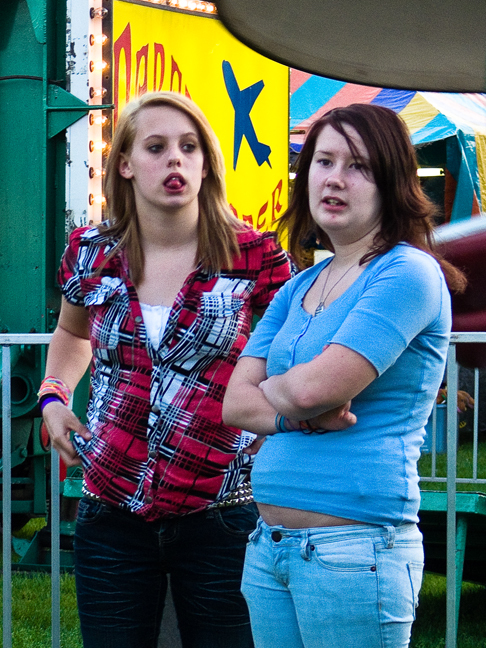 That's what people do at carnivals, relax. Who knows, back home with nose to grindstone she could be a budding wiz at math or statistics and eventually find a viable niche for herself in financial or statistical analysis. What do you see in their faces? And what kind of life would you predict for each of them?